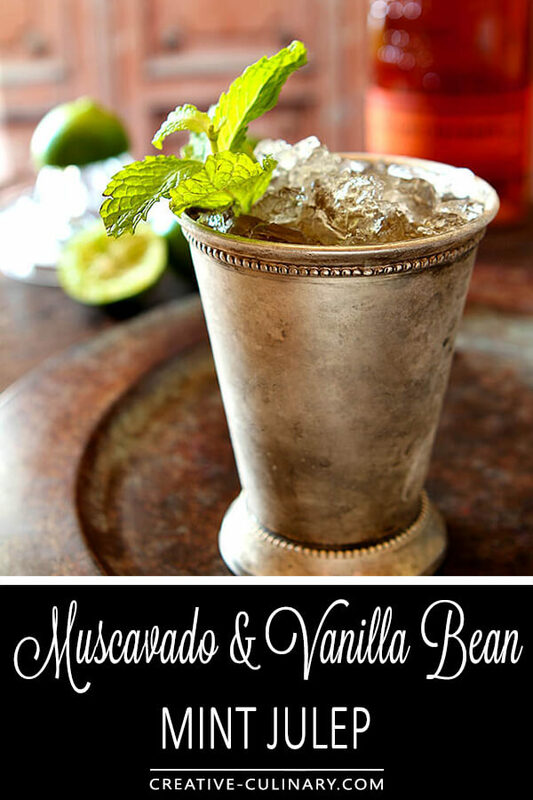 Switching out regular sugar for this version with brown sugar and adding some vanilla bean to the mix was amazing and this Muscovado and Vanilla Bean Mint Julep is my new favorite! I had great plans for a Mint Julep this year that included strawberries. I’ve been making a new version of Mint Julep each year for the past couple of years in honor of The Kentucky Derby and the ones with some added fruit have been spectacular. And then a new book arrived and those plans went straight out the door! If you knew me like a friend does, you would know exactly why she decided to send me a copy of the book Brown Sugar Kitchen. Not because I know the place or have ever been to West Oakland or even because I have a love affair with soul food. Nope…simply because I love, love, love brown sugar. I mean love so much that if in a pinch for something sweet I will take the advice of Mary Poppins but need no medicine; a spoonful of brown sugar can satisfy those cravings quickly. Goodbye fresh strawberries and hello Muscovado, my favorite brown sugar! It did not hurt at all that I had just received a bottle of award winning Bulleit Bourbon…the absolute perfect pairing in my book. Leaning heavily on the author’s recipe I also took her suggestion to add a bit of vanilla bean. We’re getting just a bit decadent here but then…have you ever seen those people at the Derby? 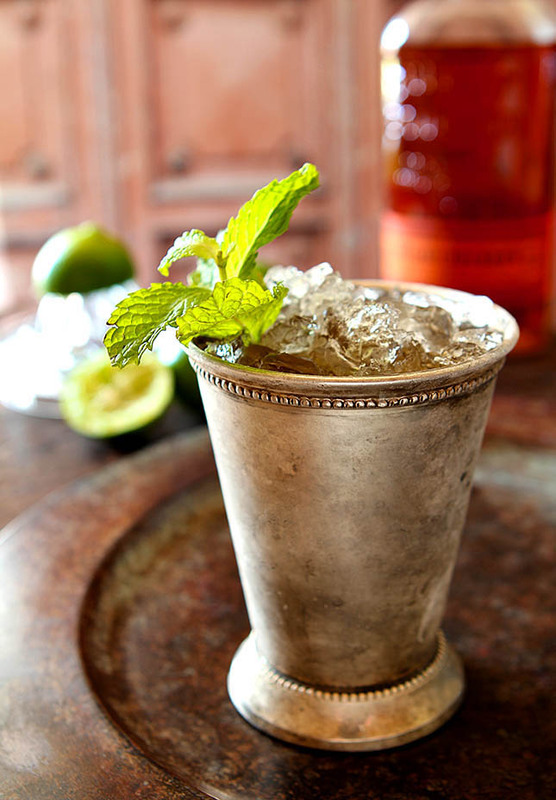 I think this Muscovado and Vanilla Bean Mint Julep would work just fine there don’t you? If you’re asking, ‘What is Muscovado sugar?’ it’s simply unrefined sugar and has a stronger taste of molasses. It’s perfectly suitable to use brown sugar (which is refined sugar that has had molasses added to it) and the darker the better to get the deeper character that the Muscavado brings to this cocktail. As for bourbon? Nothing better than Bulleit. I’ve been the lucky recipient of several different great bourbons but one thing I knew for certain that this cocktail had to include? 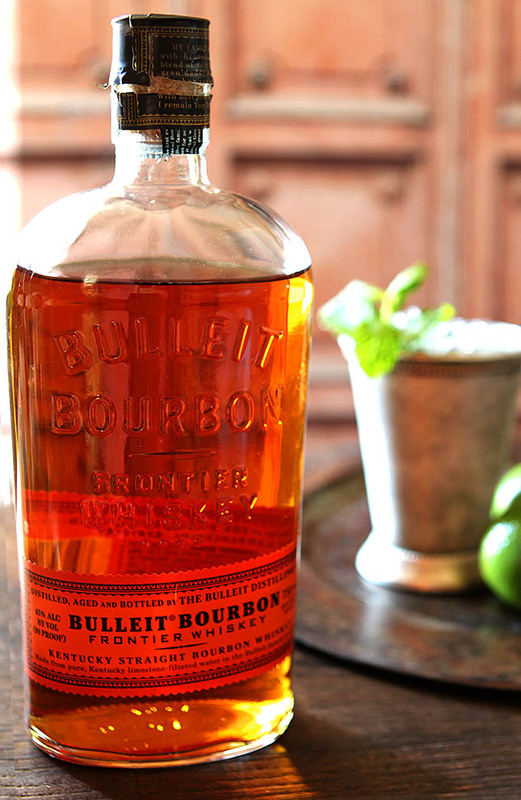 Well, it had to have bourbon made in Kentucky; anything else would have been sacrilege and Bulleit Bourbon Frontier Whiskey has been something of a darling in the bourbon industry over the last few years. It’s inexpensive, flavorful and it’s as versatile as a whiskey can be which has made it a favorite of whiskey drinkers and bartenders alike. A high rye content in the mash provides a nice spicy kick and balances well with the sweeter bourbon notes. Originally created by Augustus Bulleit and produced from 1830 – 1860 when he died it has been resurrected by Tom Bulleit, the great-great-grandson of Augustus Bulleit. He adjusted the mash bill which requires that to be a true bourbon it must include at least 51% corn. Made of 68% corn, 28% rye and 4% malted barley it’s marketed as being a product of Bulleit Distilling, but in truth it’s made in the Four Roses distillery; also well known for their high rye bourbons. Four Roses is the brand recommended by the author of Brown Sugar Kitchen so I knew I was on the right path using Bulleit and when it comes to value for the money it’s hard to beat. As much as I loved the Sparkling Blackberry Mint Julep and Honey Peach Mint Julep of years past something about this cocktail really spoke to me. Beyond the Muscovado and Vanilla Bean it is closer to a true julep and might just be my new favorite (Yes, I think I say that EVERY time I try a new mint julep)! Want something other than a julep to serve (and not just for the Derby)? Take a peek at my friend Shanna’s Simple Citrus and Coconut Cocktail fresh with the flavors of the tropics…or in her case Hawaii, of course. Be sure to tell her I said ‘Aloha.’ There is a song about a lime and a coconut that is now playing in my head! MORE DERBY? Here’s a nice compilation of Derby dishes, desserts and drinks at Parade Magazine’s Community Table that’s been put together by Brianne from Cupcakes and Kale Chips. Your party planning is officially taken care of! Have a horse you favor to win? Let me know which one…I’ll be paying attention while I’m sipping! Bring the sugar and water to a simmer, stirring to dissolve the sugar. Remove from the heat and add the mint, the vanilla beans and the pods. Stir and cover and let steep for 20 minutes. Add the ice cubes and stir to melt. Strain the syrup through a fine-mesh sieve and into a container to cool. Cover and chill until cold, 30 minutes in the freezer or an hour in the fridge. Place the mint leaves in a cocktail shaker and crush lightly with a muddler or the back of a spoon. Add the bourbon, Muscovado Mint Syrup, lime juice, and a handful of ice cubes. Shake until cold then strain into a glass packed with crushed ice. Top with more crushed ice, garnish with the mint sprig and serve. I was provided with a bottle of Bulleit Bourbon but all commentary is my own. I have to say you had me at the picture of the drink, the decadent ice cubes, the silver-copper glass and voila, the mint. Nothing says, yells, freshness like mint, especially when it is fresh mint hanging on the edge of a drink filled with ice. Hmmm. I have to say that some things just go well together, one of them is vanilla and sweetness and mint and lime juice. The subtleties of flavor, especially vanilla and lime is one of those things that make life easier and conversations interesting. Cheers. Barb – this was fantastic! It was just the right amount of bite, sweetness and mint! You are going to make a bourbon drinker of me yet! Ahh bourbon. I’m in! This drink looks and sounds absolutely perfect for the weekend ahead! It is…and maybe I need a mission to get juleps onboard the cocktail calendar for more than one week of the year. I love bourbon and I do love this cocktail! What a beautiful drink!!! I totally want to make this now. It looks delicious! Thanks Kate…absolutely make one, they are SO good! 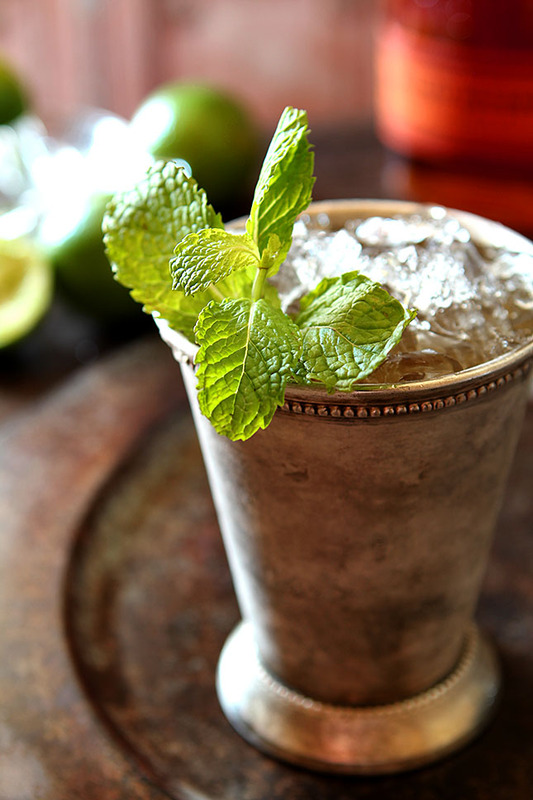 So many mint juleps out there this week! Love the muscovado sugar variation. I spent 10 years in the South so it’s a tradition I love. I’m in Denver now…they don’t even know it exists; it’s all about Cinco de Mayo! I like muscovado sugar but I’ve never used it in a drink before. Bring on the derby! I think I’ll use it more often, loved the richness of flavor it added…cheers! You’ve packed a ton of flavor in one little ole Mint Julep! Fun mix of flavors. Mint and bourbon have such an affinity for each other, don’t they? Have a happy Derby day!